Some people say that only death and taxes are certain in this world, but for most of us mere mortals, finding some kind of job to pay off those expenses is also an inescapable reality. And while the majority of us try to find stability in our craft, it is a well-known fact that for government workers stability is not exactly a guaranteed prospect. With the recent United States federal government shutdown, everyone got to see the gritty side of working for the government and the uncertainty it brought to thousands of people. 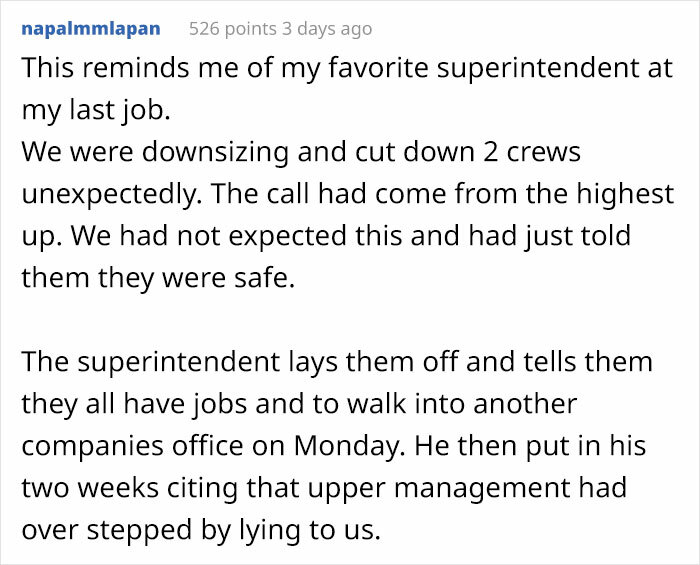 But shutdowns aren’t the only risk in the life of a government worker, as like any other job, those positions are susceptible to layoffs. And that is exactly what one Reddit user called shortadamlewis had to experience. 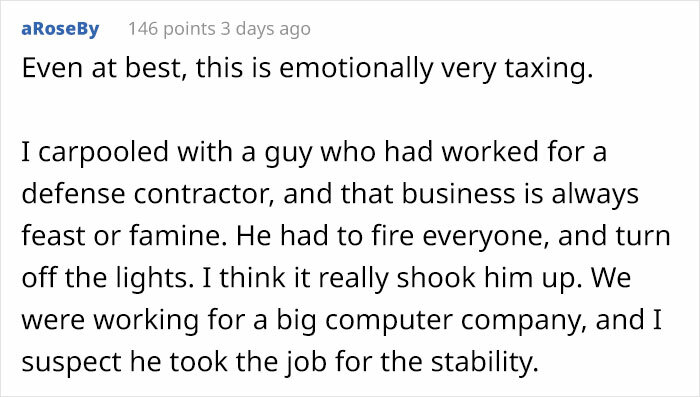 However, not only did they lose their own job, they had to let go of their entire staff. Unlike many who would be devastated in this situation, the manager took matters into their own hands and did the best with the situation they were put into. “While this is close to the whole story, it is only part of it, and I am not the real MVP here… that belongs to my old boss,” ShortAdamLewis told Bored Panda. He continued to describe his time in the Marine Corps and how he was forced to abandon his uniform and a dream career in the branch just at the time that his wife got pregnant. As he found himself with a family to care for, the man worked hard to prepare himself for a decent job as a civilian. After jumping from one contract to another, he ended up with the job that led to the story that happened 5 years ago. 1-Click Dropship GOLD will add an unlimited number of stores and products from different platforms allowing you to grow your ecom business to insane levels! 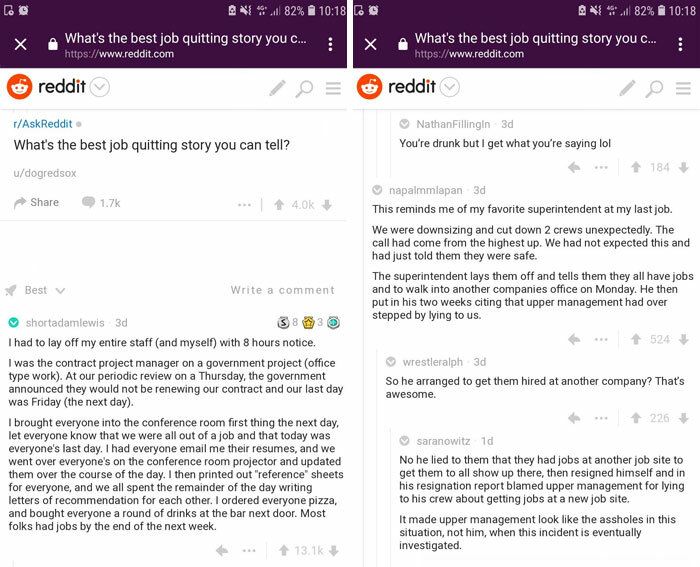 “I had to lay off my entire staff (and myself) with 8 hours notice. I was the contract project manager on a government project (office type work). At our periodic review on a Thursday, the government announced they would not be renewing our contract and our last day was Friday (the next day). “I was brought on as the deputy project manager on a small company to a failing project, delivering custom software for the government” the man recalled. “The PM they brought in had decades of experience in the corporate world and was very knowledgeable in how to actually run the project from an experience point of view. I had the knowledge and expertise from traditional schooling and the military” he explained. Even though they worked well together, it only took one call from the goverment for it all to fall. As the contract reached the end, the entire team was to be laid off. “I sat down with the PM and we discussed what we should do. We were part of a small company that had maybe 40 employees across a few states, and we were the only employees for 100 or so miles so there was no other work for us to fall back on. We called our company leadership, and confirmed there was no work for anybody, and then called a meeting” he explained his approach. They decided to call everyone in for a meeting and break the news. “I’m glad we told everyone as soon as we knew. I seem to be the expert on resumes and getting jobs, so I told everyone to bring a copy of their resumes and that we’d look them over in the conference room” the man continued. He also revealed that while the bosses gave everyone termination paperwork, he was pulled aside and taken over to the government offices as “[he was] very employable on paper”. “In the meantime, my PM boss took everyone out for drinks. He is the real MVP here, not me[.] Letting people go is never fun. When we can, it never hurts to try and set someone up for success in the future even if they can’t be a success working with you” he concluded.